In the last three years, all the major U.S. airline frequent flyer programs have had devaluations. Delta has gone further than everyone else though, by removing its SkyMiles award charts early last year. The goal was probably to stop complaints about program’s frequent devaluations because if you don’t have a chart you may not know that the award levels have increased. But what they are doing now has completely changed devaluations as we know them. Read on to see what we have uncovered about upcoming changes and when they take effect. The airline no longer gives its members a warning that its flights are going to cost more. Before Delta changed the rules, the traditional method of devaluing a frequent flyer program had always been that an airline would set a date, and every flight you would book before that date would be honored at the old redemption level. It’s safe to say Delta has revolutionized devaluations in a profound and game-changing way. The Delta Saver rates between the U.S. and Europe in business are currently 62,500 miles. This is a business class award calendar between New York and London. Delta traditionally has a lot of availability on this route whether on its own metal or Virgin Atlantic. Here is what happens after December 31. 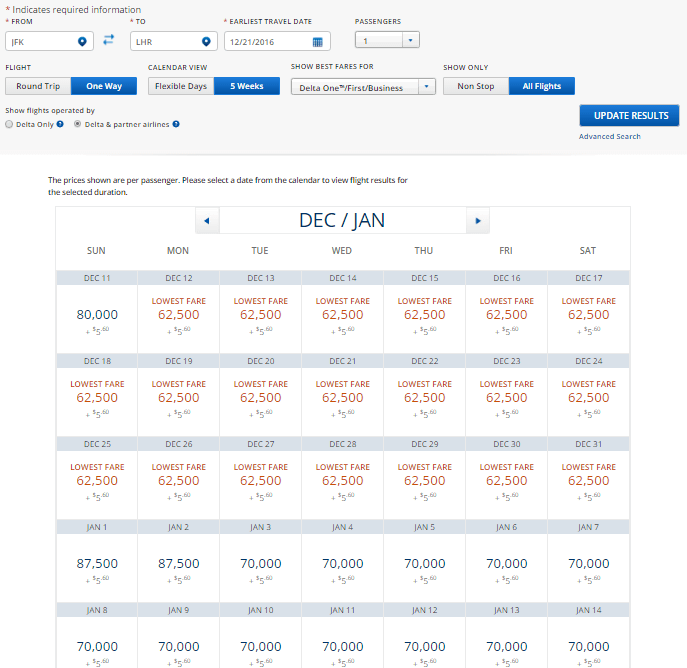 As you can see, all Saver available dates that are clearly priced at 62,500 miles before the end of December, show the 70,000 miles price tag in January. Unfortunately, this is not a fluke. A search between LA and Paris shows the same pattern. 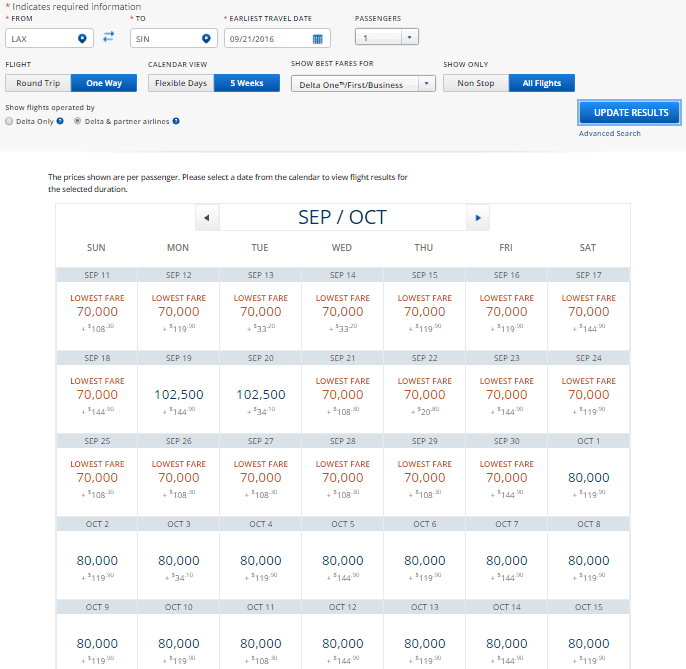 Unlike other airlines and unlike its own devaluation methods 9n the past, Delta nowadays simply tells you that your flight is going to cost more after a certain date. You are not getting a grace period or a fair warning anymore. This devaluation is just the latest one in a long string of surprise devaluations. 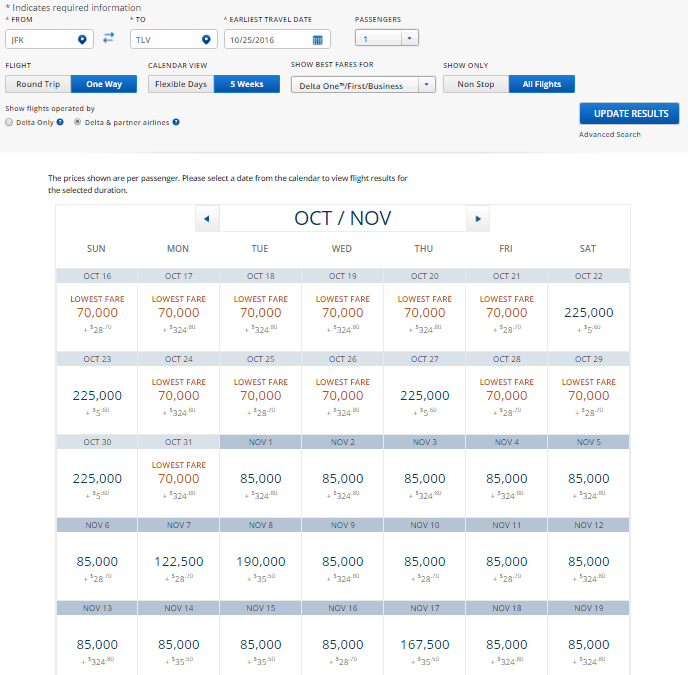 Back in January, Delta devalued business class to Asia, Australia/Oceania and Latin America for travel starting on October 1, 2016, and did so in the same quiet and casual manner. All levels below are shown for oneway travel. A business class award rate from the U.S. to Australia/Pacific raises from 80,000 miles to 95,000 miles. Asia from 70,000 to 80,000 miles. Southern South America from 62,500 to 75,000 miles. Africa from 70,000 to 80,000 miles. South Africa from 80,000 to 95,000 miles. 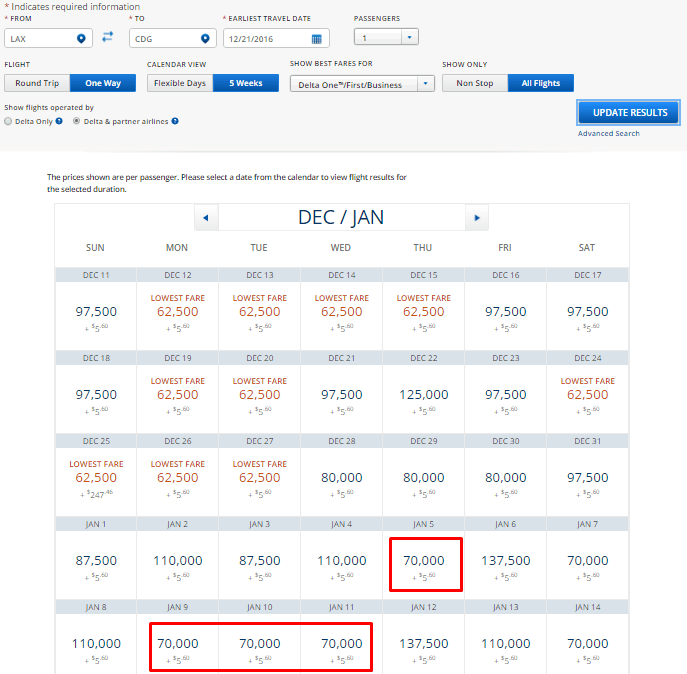 In addition, the new business class redemption level to the Middle East, including Israel, will jump from 70,000 to 85,000 miles on November 1. With the 2016 business class devaluations, Delta has become more expensive than the competition for the vast majority of long-haul markets. It must’ve been a strategic step, since it’s hard to imagine that Delta wouldn’t have realized that. Is Delta’s business class product really much better than American’s and United’s? Delta is touting its rebranded long-haul business class product called Delta One as Business and First rolled in one, and in most cases Delta One cabins feature comfortable lie-flat seats with aisle access for every seat. Delta One, however, doesn’t have a universal business class seat across all aircraft and uses the same seats as other airlines. Delta flies 767s to Europe in staggered configuration, 777s to Asia, South Africa and the Pacific with Herringbone design, and 747s with reverse Herringbone seats. Its long-haul narrow-body aircraft feature lie-flat seats too, at least most of them, (Delta still flies an old, domestic-type reclined business class cabin to Iceland, for example). You can read more about different types of Delta business class seats here. So the answer to the question whether or not Delta One is that much better than American and United business class seat and service is sometimes, but not always. And the battle for winning the hearts and minds of a premium class revenue customer is heating up. Both American and United feature lie-flat seats on most long-haul flights, and United has recently unveiled its new business class product called United Polaris with pod-like suites, upgraded bedding, improved cuisine and new lounges that will be built especially for Polaris passengers. American is not lagging far behind, getting rid of its last remaining angle-flat seats on 757s and upgrading its current lie-flat seats on all other long-haul routes. 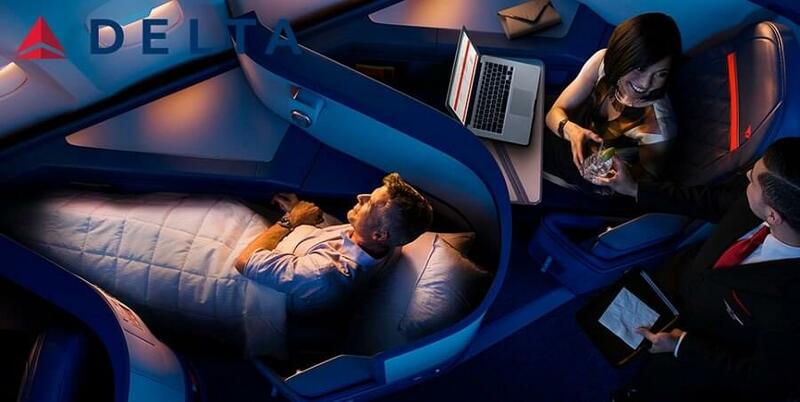 Maybe this is why Delta has recently unveiled the plans for the new all-suite business class cabin, which is something no one has ever done before (except JetBlue Mint, and there are only a few enclosed seats in the cabin). Technically speaking, though, Delta wasn’t the first airline that had come up with the concept of a business class suite – in 2015, its long-time nemesis Qatar Airways had announced the plans for the new “super business class” with sliding doors and a double bed in the middle section. The race is on.